Mike Ilitch graduated from Cooley High School and entered the U.S. Marine Corps four years before becoming a successful entrepenuer. There is an incredible story behind Mike Ilitch, owner of the Detroit Red Wings. 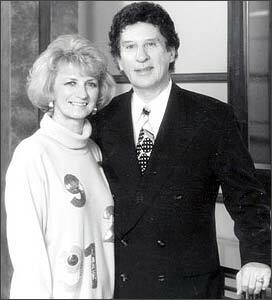 From humble beginnings, Ilitch has emerged as one of the most successful entrepreneurs in the United States. In fact, in 2006, Mike Ilitch ranked 242nd on the list of the 400 wealthiest Americans, and officially joined the billionaire's club. Mike's father, Sotir, worked as a tool-and-die maker for Chrysler while his son embraced athletics. A sure-handed shortstop with a good bat at Cooley High School in Detroit, Ilitch was scouted by the hometown Detroit Tigers and offered a $5,000 bonus to sign with the organization. Mike insisted on double that amount and warned that if the Tigers wouldn't pay him a $10,000 bonus, he would join the U.S. Marine Corps. The Tigers balked and in 1948, Mike signed up to serve his country. As the Korean War escalated, Ilitch was told he'd be sent to the front lines. But while on a military ship crossing the Pacific, he was informed by a general that when they stopped in Hawaii, he would not be continuing with his colleagues. "He took me off the ship so I could play for a (military) baseball team in Pearl Harbor," recalled Ilitch. "I finished my service there." The military hospital at Pearl Harbor made an indelible impact on the young Marine. He recalled being horrified seeing wounded troops returning from Korea in wheelchairs and bandages. "It made a real impression," he said. "Could I have ended up that way if I had been sent to Korea? Absolutely!" After his four-year tour of duty concluded, Ilitch returned to Detroit, signed with the Tigers, and spent four years in the Detroit system from 1952-1955, mostly with the Tampa Smokers of the Florida International League, a Class B minor league. His parents didn't approve of their son's career choice, but Mike had a dream and he worked hard to fulfill it. To make spending money while playing ball, Ilitch convinced a nightclub owner that he should be serving pizzas. The Detroit-area businessman hired Mike to make pizzas in a back room of the west-side nightclub. Patrons loved the new treat, and Mike had stumbled onto an idea that was about to skyrocket. "I was fascinated by water and flour," he told the New York Times. "You knead it into dough, put it in the oven, and it comes out baked. Wow!" Michael and Marian Ilitch founded Little Caesars Pizza in 1959 prior to purchasing the Detroit Red Wings in 1982. The two met on a blind date arranged by Mike's father and went on to have seven children. Then, a broken leg ended Ilitch's baseball career and extinguished his dream. Mike, who, on a blind date in 1954 had met a beautiful young reservation clerk from Delta Airlines, was married to Marian Bayoff in 1955, and eventually, the couple raised seven children: Denise, Ron, Michael Jr., Lisa, Atanas, Christopher and Carole. To support his expanding family, Mike took a job with a cement company, later selling dinnerware door-to-door and aluminum siding. He became a partner in an awning business, but was bought out by his partners. Using the pizza idea as a springboard, Mike and Marian decided to open their own pizza parlour, but did not have enough money to start their own business at that time. But, by investing their life savings of $10,000 and borrowing an additional $15,000, the Ilitches were able to open their own business by 1959. Choosing a strip mall in Garden City, a suburb of Detroit, Mike planned on naming the pizza parlour 'Pizza Treat,' but Marian insisted that 'Little Caesar's' (her nickname for Mike) would be a better choice. In May 1959, Little Caesar's Pizza Treat was opened. Mike handled the menu, pizza-making and marketing while his wife took care of the financial aspects. Through prudent business practices, by 1962, the couple had their first franchise. And it was only skyward from there. The chain expanded throughout the American Midwest, but during the following three decades, was comprised of 4,000 restaurants encompassing much of the United States, had crossed into Canada and moved across the Atlantic into parts of Europe. The $2.15 billion annual sales in 1993 placed Little Caesar's as the third largest pizza chain in the world. 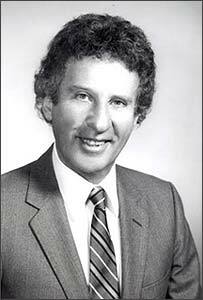 In 1982, Mike Ilitch followed his passions and ventured into professional sports team ownership. Using profits from the pizza chain, Ilitch tried to buy his beloved Detroit Tigers but was out-bid by his pizza rival, Tom Monaghan of Domino's Pizza. But Ilitch was presented with the opportunity to buy the hometown Detroit Red Wings, a struggling franchise, for a reported $8 million. The Wings had finished last in their division for four consecutive seasons. (Centre) Illitch and the Detroit Red Wings celebrate after defeating the Washington Captials in the 1998 Stanley Cup Finals. One of the NHL's 'Original Six' franchises, the Detroit Red Wings had not generated much interest when Bruce Norris first put the team on the market, but Mike saw potential. "This franchise is a sleeping giant waiting for someone to do something with it," he told Sports Illustrated. Luring Jimmy Devellano away from the New York Islanders, Ilitch went to work constructing not only a winning team on the ice, but at the turnstiles, too. He pumped money into the team and brought it back to life. Draft choices like Steve Yzerman, Gerard Gallant, Bob Probert, Adam Oates, Steve Chaisson and Joey Kocur built a strong foundation, and Devellano added key veterans to supplement his young guns. Within four years, annual ticket sales had catapulted from a meager 1,500, (less than 10% of the Joe Louis Arena's capacity) to near-sellouts on a nightly basis. Ilitch employed tried and tried marketing techniques, including offering free cars as prizes awarded between periods. In Sports Illustrated, Mike referred to himself as "a fan with an owner's pocketbook." It took time to assemble a winning roster, but by 1987-88, the Red Wings had won their division championship and were contenders for the Stanley Cup. They repeated as division champs in 1988-89, 1991-92 and 1993-94. By the mid-nineties, the franchise was worth an estimated $200 million, and in 1991, Mike Ilitch was awarded the Lester Patrick Trophy for his outstanding contributions to hockey in the United States. Although Mike Ilitch deserves much of the credit for the Wings' success, he learned early on that by surrounding yourself with great management and giving them the tools with which to do their jobs, it could only make him and his investment look better. Jimmy Devellano helped the renaissance of the Red Wings under Ilitch, but in 1993, the hiring of one of the greatest coaches in NHL history paid huge dividends. Scotty Bowman joined the Red Wings, and in 1994-95, Detroit reached the Stanley Cup final for the first time since 1966. In 1996-97, Bowman led the Detroit Red Wings to their first Stanley Cup championship since the spring of 1955. The reigning Red Wings repeated with a Stanley Cup win again in 1997-98. 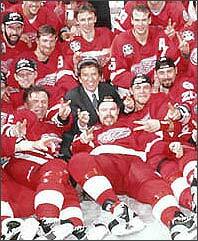 In 2001-02, Ilitch's team won the Stanley Cup again; the tenth in franchise history. In 2004, Forbes magazine valued the Detroit Red Wings at $248 million; a far cry from the $8 million paid by Ilitch twenty-two years prior. But Mike's love of sports wasn't restricted to NHL hockey. Little Caesar's, under the direction of the Ilitches, sponsored minor hockey in the Detroit area. Then, in 1992, the Detroit Tigers baseball club went up for sale, and Ilitch salivated like Pavlov's dog (or someone ready to dig into one of his pizzas). And to make the purchasing of the Major League Baseball team of his youth even sweeter, Ilitch bought the team for a reported $85 million from Tom Monaghan, his rival from Domino's Pizza. Using the template used to revive the sagging Red Wings, Mike used clever marketing, savvy business practices and surrounded himself with winners like manager Jim Leyland. In 2006, Detroit's Tigers made the playoffs for the first time in nineteen years, and not only did they make the playoffs, the Tigers went on to the World Series, only to fall to the St. Louis Cardinals. 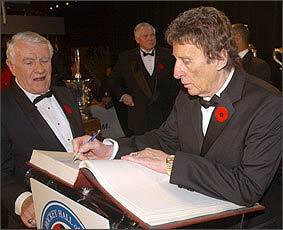 Inducted into the Hockey Hall of Fame in 2003, Mike Ilitch proudly signs the ceremonial Honoured Members book. The Ilitches were briefly owners of an Arena Football League franchise. The Detroit Drive debuted in 1988 and competed in the Arena Bowl in every year of their six-year existence, but in 1993, when Mike bought the Tigers, he sold the team and the franchise moved to Worcester, Massachusetts. That same year, Ilitch bought the Detroit Rockers, a professional soccer team. The benevolence of the Ilitch family is clearly illustrated by their extraordinary promotion of their hometown. Since 1982, the Ilitches have spent over $200 million in revitalizing Detroit's downtown. "I was raised in Detroit," Mike began, in an interview with the Detroit Free Press. "I came from zero. This community helped make me. It's nice to give something back." Recognizing his enormous contributions to 'Hockeytown' and the Detroit Red Wings, Mike Ilitch was inducted into the Hockey Hall of Fame in the Builder Category in 2003. "By far, this is the biggest moment of my professional life," he said. "It's been an absolute labour of love. I'm so pleased with this moment that when I was informed, I could barely speak." The following year, he was also added to the United States Hall of Fame. Successful beyond his wildest dreams, Mike Ilitch is also modest to a fault. "Be humble and never toot your own horn," he stated.